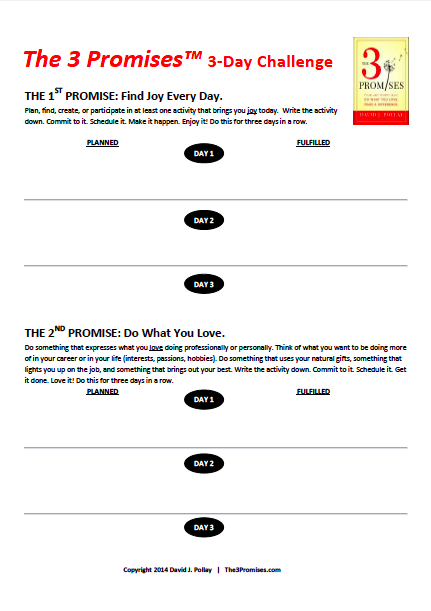 The 3 Promises™ Three Day Challenge (pdf). Join thousands from around the world and take The 3 Promises Pledge. 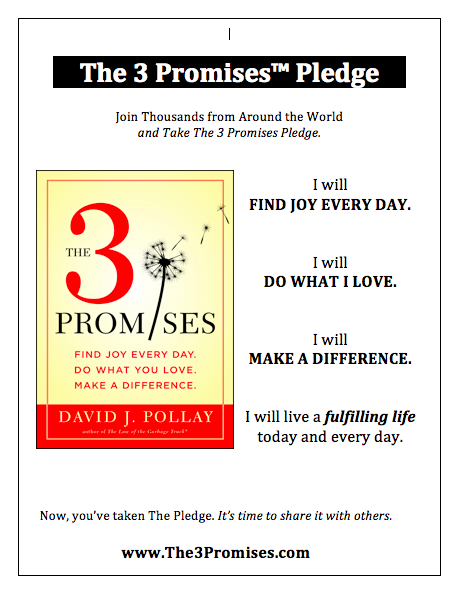 Download The 3 Promises™ Pledge (doc). When you attend one of David's speeches or seminars, you will take The No Garbage Trucks! Pledge with him. And you'll have a fun and meaningful time doing it! The Pledge has been translated into 48 languages, and it has been taken by people from more than 100 countries. Download The No Garbage Trucks!™ Pledge (pdf). Translations available in Arabic, Chinese, French, German, Hebrew, Hindi, Japanese, Korean, Russian, Spanish, Swahili and Urdu. When you read David's book The Law of the Garbage Truck, you will learn how people around the world are declaring their families and businesses No Garbage Trucks! Zones. Download of The No Garbage Trucks! Zone Poster (pdf). Book clubs, bible study groups, business teams, and other reading groups are discussing and sharing The Law of the Garbage Truck. 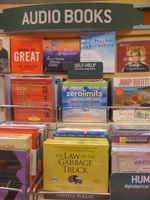 To help them lead their conversations, I included reading group guidelines in the book (pp 216-219). We have also put the reading group guidelines online for our audio book listeners. Download the Reading Group Guidelines (pdf). There are Eight Commitments of The Law of the Garbage Truck. Each is key to increasing "happiness, success, and civility in the world." You can download The Eight Commitments by clicking the link below. Download The Eight Commitments (pdf). The Fourth Commitment of The Law of the Garbage Truck is "Do help the Garbage Trucks you can (Help others stop dumping)." The essence of this commitment is to focus on bringing out the best in others by following "The Garbage Truck Communication Rule." You can download "The Rule" by clicking the link below. Here are the answer sheets for the quizzes I present in the unabridged audio book recording. Included in every copy of The Law of the Garbage Truck, there are four No Garbage Trucks! Pledge cards for you, and the people you care about. If you have listened to The Law of the Garbage Truck audio book, I want you to have "The Pledge" cards, too. You can download the cards by clicking the link below.